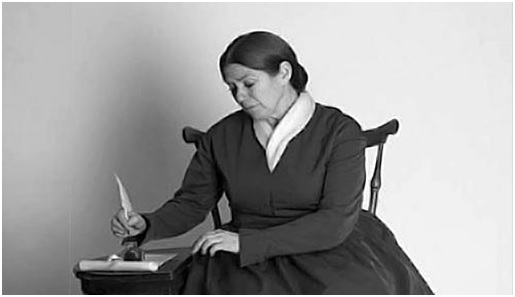 Sunday, March 24, 2019, 2 pm at One Grafton Common Great Hall, actress and activist Lynne McKenney Lydick will bring abolitionist Abby Kelley Foster to life in her inspiring one-woman play, “Yours for Humanity — Abby”. NOTE: the snow date of Sunday, March 24th has been triggered due to the snow on the original date. The play is based on the letters and speeches of Foster in 1854, during a time of many social and political differences in our country. Hear Foster deliver her powerful orations against slavery and prejudice, which helped to change the views of many. Abby Kelley Foster (1811-1887) was a radical abolitionist, women’s rights activist. Her first National Woman’s Rights Convention in Oct of 1850 was held in Worcester, MA where she lived along with her husband Stephen and their daughter Alla. A member of the Western Anti-Slavery Society, she dedicated her life to social justice, spending nearly 20 years traveling across the nation as a lecturer for the American Anti-Slavery Society. It was through the membership of this society that Foster knew Sarah and Ridgeway Haines, of Alliance, OH who were also dues paying members of the Western Anti-Slavery Society. She and her husband, Stephen S. Foster, also an abolitionist, would stay at the Haines House in OH when they were speakers. The society’s annual meeting in the 1850s was held alternately in Salem, OH and Alliance, OH. The Haines land would temporarily house a tent that accommodated large crowds. A report from the Anti-Slavery Bugle said that 3,000 attended over a three-day weekend. The first in a four part series, “Yours for Humanity – Abby” has been funded by Mass Cultural Council. The sponsors of this four part series are: The Grafton Historical Society, The Grafton Public Library, and the Unitarian Universalist Society of Grafton & Upton. The Grafton Public Library will coordinate this spring’s Community read with related books from March through April.